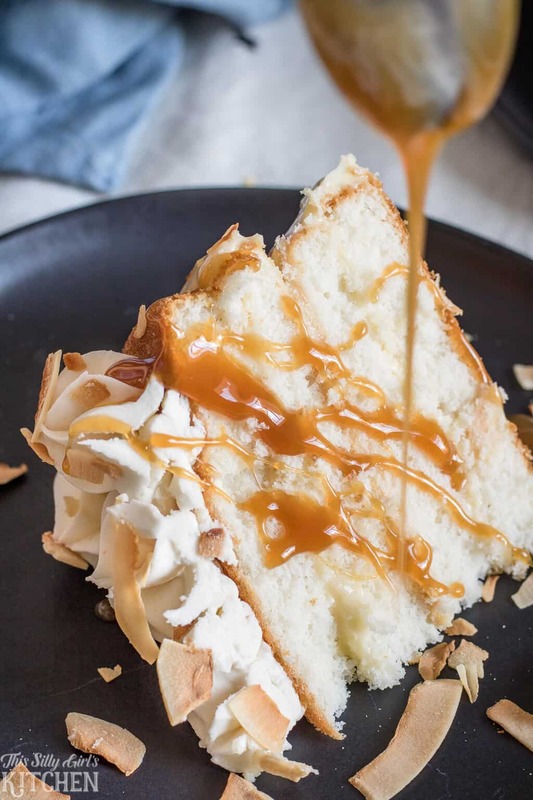 Naked Coconut Cake, layers of white cake, coconut pudding and coconut frosting, all topped with toasted coconut and caramel sauce! 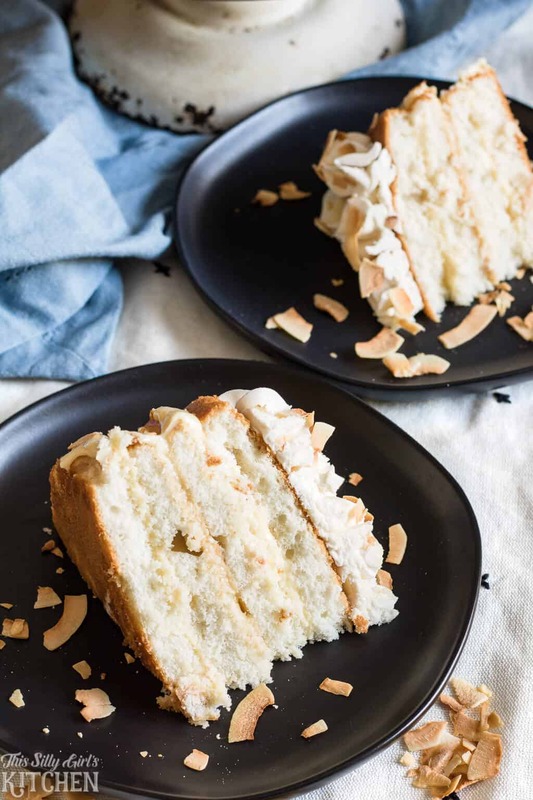 A coconut cake you will want to make (and eat!) over and over again! 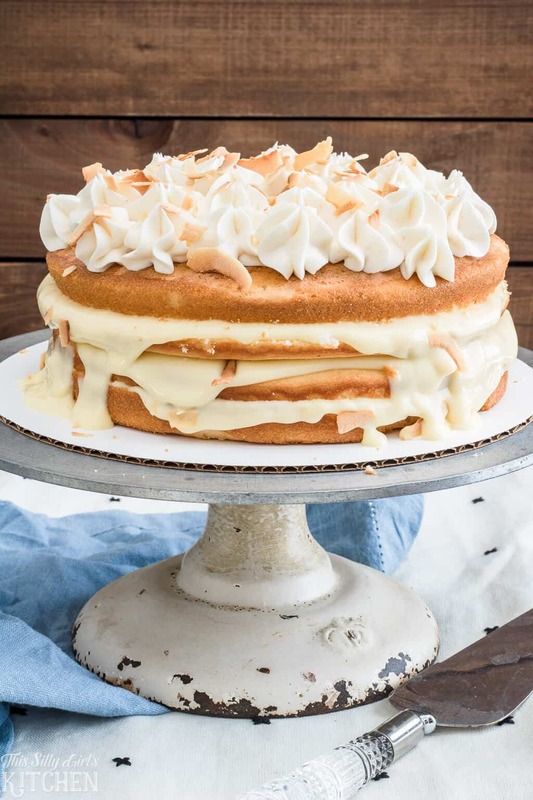 Naked Coconut Cake, the easiest of layer cakes! This post is sponsored by Coffee-mate® Creamers. All text and opinions are my own. I say this is the easiest of layer cakes because it totally is! Have you ever tried to make a four layer cake with frosting all around? Crumb coat, waiting and everything?! Unless you are a super hobby baker or professional, they can get pretty intimidating, especially if you don’t make them all the time. But, with the “naked” cake trend you don’t have to worry about that! I use pudding between my layers to make the cake super moist as well. 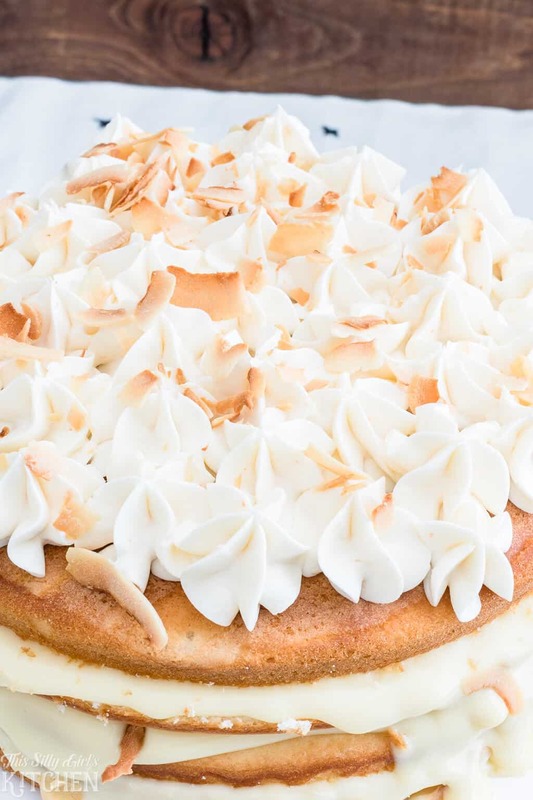 The coconut cream cake of your dreams! 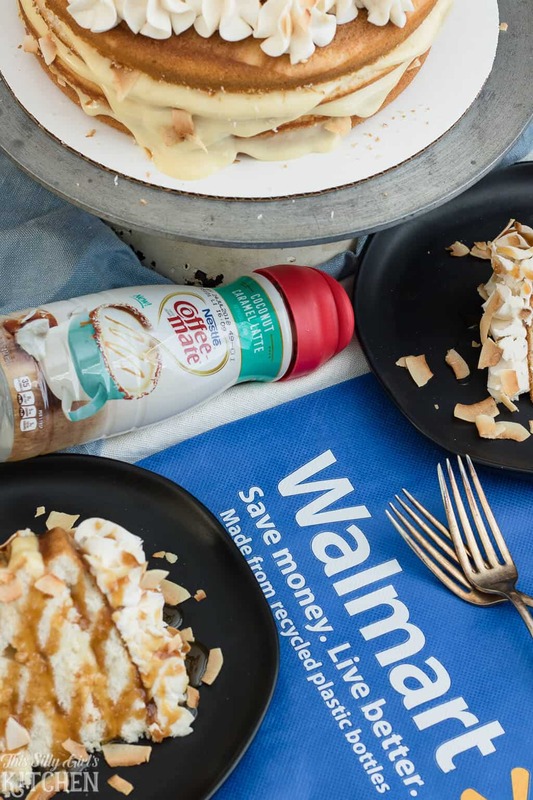 Coffee-mate® Creamers has new Dessert Creamers available at Walmart. I had to give them all a try! The flavors are Cookies & Cream, Coconut Caramel Latte, and Toasted Marshmallow Mocha. As you guessed, the inspiration for today’s cake came from the Coconut Caramel Latte flavor! I found them last weekend at my local Walmart right by where they keep all of the other refrigerated creamers. I couldn’t wait to get home to try them! It is the perfect pair to my coconut cake! I used the Coconut Caramel Latte flavor in each element of my cake as well. In the cake layers, the pudding, and the frosting! A lot of naked cakes actually still have frosting on the outside. But, in this case, I used pudding instead, I really think this is a nice twist and perfect for people who aren’t the biggest frosting fans. I made two 9-inch white cakes flavored with coconut extract, let them cool completely. Then, I cut them in half. I placed one half of one cake on the bottom of the cake server, adding 1/3 of the pudding mixture, smoothed it out, then repeated with the rest of the cake layers. 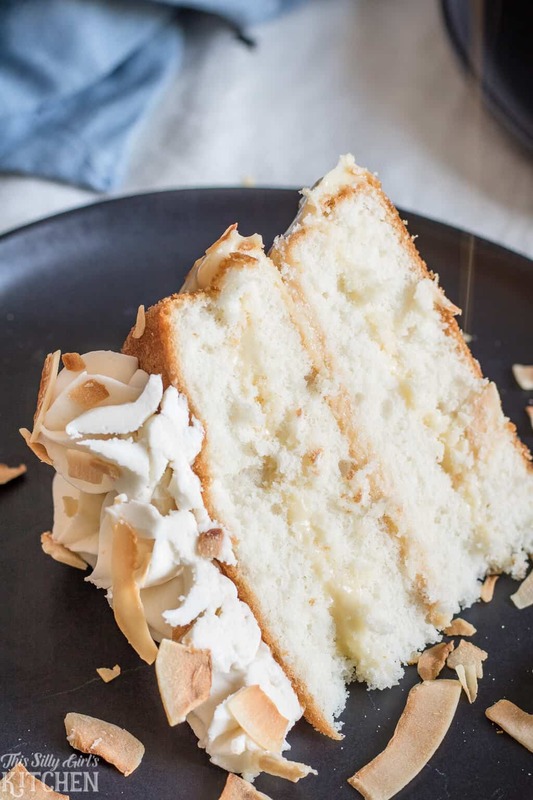 Topped it with the coconut frosting, toasted coconut, and that’s it! The actual assembly of the cake was the fastest part, which I love! I also served it with caramel sauce because… duh. 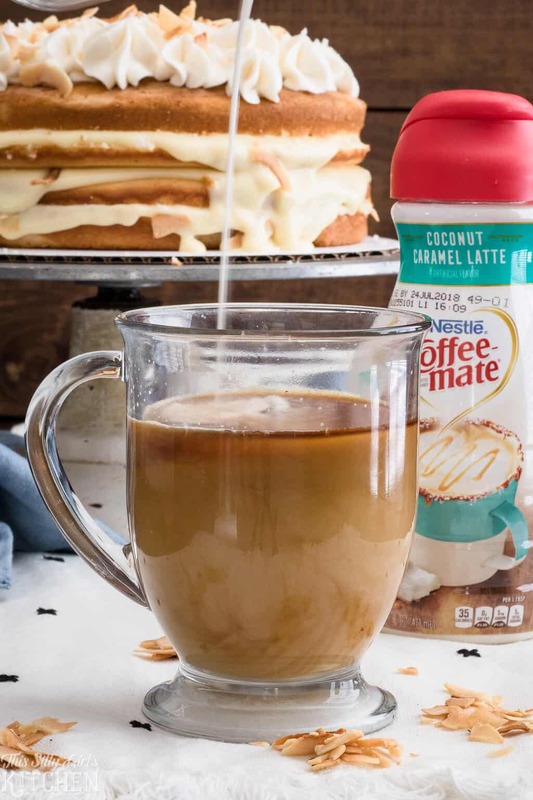 Plus, it goes perfectly with the creamer and the caramel flavors from the Coffee-mate Creamer was in all elements of the cake, so it was just screaming for more! 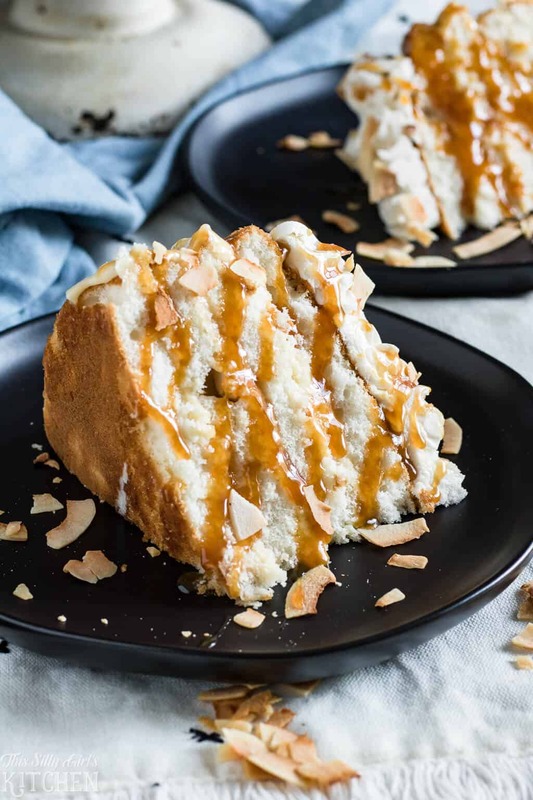 Who doesn’t love an easy Coconut Cake recipe! Don’t have toasted coconut on hand? No worries! I used big flake coconut for the cake because I just think it looks prettier but, this method works for all coconut. Preheat your oven to 325°F degrees. Place coconut into a single layer on a baking sheet. Bake for 2-minute intervals, tossing coconut in between with a spatula. Pull baking sheet just as the coconut is starting to brown and become fragrant. Immediately transfer coconut to another dish, in a single layer if possible. It will continue to cook and brown until cooled so keep that in mind! The coconut shown in these photos only needed to toast for 6 minutes. The frosting recipe made juuuuust enough for the top of this coconut cake. 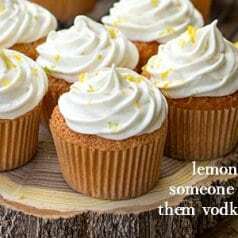 If you like more frosting, I suggest doubling the recipe. I highly suggest making your own caramel or buying some to use as a drizzle over the cake. It is the perfect finishing touch! 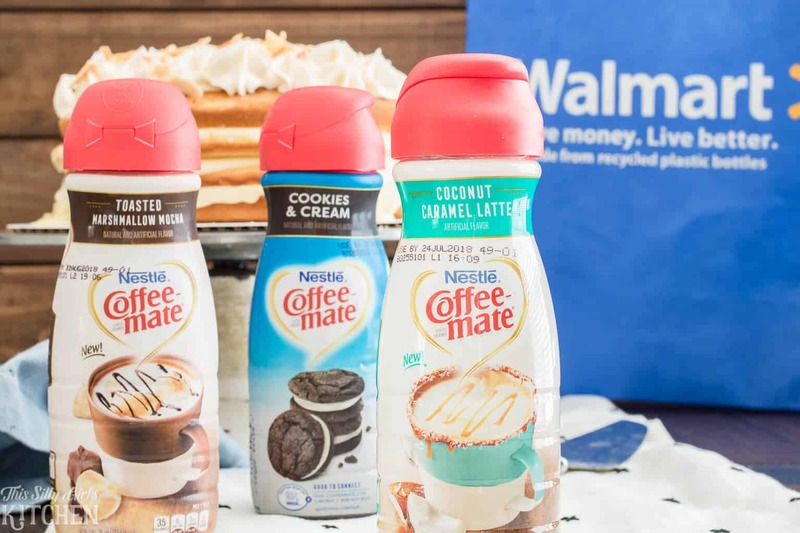 Don’t forget to check your local Walmart for new Coffee-mate Dessert Creamers! Be on the lookout for an in-store Coffee-mate sampling event during May 10th-13th at select Walmart stores, too. Let me know in the comments below which one is your favorite! And be sure to check here for additional information and recipe inspiration on the new Coffee-mate Dessert Creamers! 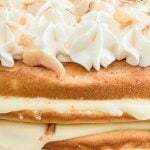 Naked Coconut Cake, layers of white cake, coconut pudding and coconut frosting, all topped with toasted coconut and caramel sauce! Preheat oven to 350°F degrees. Prepare two 9-inch round cake pans, set aside. 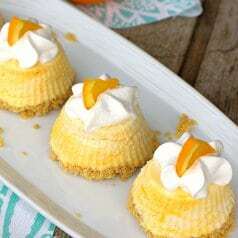 In a large bowl, add the cake mix, butter, egg whites, water, creamer, and extract. With a hand mixer on medium-low speed, stir to combine for 30 seconds. Whip on medium speed for 3 minutes. Evenly pour batter between the two cake pans. Bake cakes for 25-30 minutes until a toothpick inserted into the center comes out clean. Let cool in the pan 5 minutes, turn out onto a wired rack and let cool completely. Add the creamer, half and half, salt, and cornstarch in a medium-sized stockpot. Whisk until there are no lumps. Place over medium heat and bring to a simmer, stirring constantly. Once thick, take off the heat. Temper in the egg yolks and add the butter. Place in a bowl to cool, whisking every so often so a film does not form. You want the pudding to be cooled yet not completely set. In butter in the bottom of a stand mixer or in a large metal or glass bowl. Whip on medium to cream the butter until smooth. Add the powdered sugar a little at a time, mixing in to combine. Once all the sugar is added, add in the extracts, whip to combine. Add the creamer one tablespoon at a time until incorporated. Whip on high for 3 minutes until fluffy. Cut each cake in half lengthwise evenly. On the bottom of your serving dish, add a small dollop of frosting, this will help to keep the cake from moving. 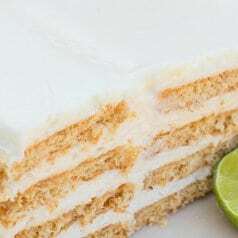 Place on bottom layer of a cake on top. Add one-third of the pudding mix and smooth to the edge, add a sprinkle of toasted coconut, optional. Add the top of the cake, add another 1/3 of the pudding, smooth to the edge, add coconut, optional. Taking the second cake, take the top and flip it over crumb side up and place on top. Add the remaining pudding, smooth to the edge and add coconut, optional. Add the remaining piece of cake on top, so the bottom is now facing up and it is a flat top. Pipe on or smooth on frosting just on the top. Place in the fridge for at least an hour to set, this will make it easier to cut. Top with remaining toasted coconut, optional and serve with caramel sauce, optional. This cake is so perfect for a birthday or a dinner party! The frosting is amazing! This cake is so so good! We love coconut and this is a favorite!